As an owner of a large dog breed, you’ll need a few basic items including a secure, comfortable dog crate. Dog crates are invaluable tools that can make it much easier for you to give your furry friend a long, happy life. Crates give you a way to ensure your pup stays out of trouble while you are away, as well as when the cable guy drops by. They are very helpful during the initial housebreaking period, and they even serve as a secure hiding place for your pup – a place into which he can retreat when he needs a little peace and quiet. But you can’t buy just any dog crate; you have to carefully consider the different options available to find one appropriate for your big breed. We’ll help you do so below, by explaining the different things to seek in a kennel, and the best ways to use one. We’ll also share our opinions about five of the best crates for large dogs (if you are in a hurry, you can see our five favorites in the chart below). A lot of owners – particularly first-time owners – are uncomfortable with the idea of putting their precious pooch in a tiny box. But rest assured, when provided with a high-quality crate of the proper size,most dogs love using them. By and large, humans prefer hanging out in big spaces. We want gigantic homes, huge cars and 4 feet of space between the seats in a movie theater. But dogs (and many other canines) don’t share this preference. They still appreciate stretching out and having room to run, but they don’t mind crawling into small spaces to sleep, whelp puppies or feel safe. Don’t believe me? Check out how this 110-pound Bernese Mountain dog likes to cram himself under his owners’ bed. Use a crate the right way and your dog will love it; use it the wrong way, and he’ll view it as a punishment. Fortunately, it is pretty easy to use a crate the right way. 1. Use a crate of the proper size. Crates that are too small for your dog are cruel, but those that are too large cause their own slate of problems — insert Goldilocks metaphor here. The basic rule of thumb is that crates should be tall enough that your dog can raise his head while standing without bumping into the top, and it should be just long and wide enough to allow him to turn in a full circle. 2. Use only well-built crates that lack sharp edges or other hazards. Poorly built, “economy” crates are often worse than having no crate. Cheap materials and manufacturing techniques will often cause these crates to feature sharp edges or fur-pinching cracks, which will injure your pet. By contrast, the best crates for large dogs will not present these types of hazards. The difference in price between an economy model and a high-quality unit is rarely that big of a difference, and your pup will thank you. Besides, you’ll obliterate any savings from purchasing the cheap option the first time you have to take your dog to the vet to treat one of these injuries. 3. Use a crate that is strong and secure enough to contain your dog. You are entrusting a crate with keeping your dog safe, so you must use a crate that will keep him safely inside while you are gone. Although there are a few Houdini dogs out there that figure out latches, you can usually thwart these buggers with a zip tie or similar bit of technology. On the other hand, there isn’t any good way to make a flimsy cage sturdy. Big or strong dogs can often bend the wire or tear apart the seams of cheap crates, so always avoid crates that are in any way suspect. 4. Never leave your dog in a crate for an inappropriate length of time. Your dog isn’t a criminal, so don’t treat him as though he is. While he may not mind hanging out in his crate while you are at work or overnight, he needs to be able to get out, stretch his legs, run around and bond with his people for a large portion of the day. There’s also the issue of answering Nature’s call. 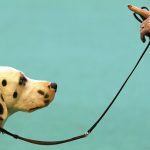 Most adult dogs will be able to go about 6 to 8 hours between bathroom breaks, and some can even hold it longer. However, puppies can only hold it for about one hour per month of age, up until they are 6 months old. In other words, a 2-month-old puppy will need the chance to pee every 2 hours. 5. Don’t punish your dog by making him go into his crate. You want your dog to feel comfortable in his crate, so always treat it like a positive experience, especially at the outset. You may even introduce him to the crate by tossing in a treat or two. Don’t shut the door the first few times, just let him go get his treat and wander out when he wishes. Later, once he’s comfortable, you can begin closing the door and leaving him inside for increasingly long periods. 6. Allow your pup to use the crate as a safe-space. It’s generally a good idea to leave your dog’s crate door open when he’s not inside, so he can get away from everything when he feels nervous. Owners of particularly anxious pups may find it helpful to cover metal crates with something opaque to make it feel more den-like. 7. Think carefully about the things you leave in your dog’s crate. There isn’t broad consensus regarding the things you should and shouldn’t place in your pooch’s crate. Some vets, breeders and trainers recommend feeding your pup in his crate, while others find this unnecessarily risky. Some encourage owners to leave a durable chew toy in with their dog, but others feel that because no toy is truly indestructible, this is also a bad idea. The same things could be said of blankets or towels. 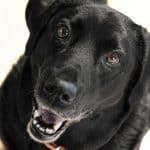 You’ll have to make up your own mind about these issues, but be sure to think through the pros and cons carefully and keep your dog’s best interests in mind. There are three basic types of crate. The first two are appropriate for large dogs, but the third is only suitable for small to medium breeds. Metal crates are constructed from thick, plastic-coated wire on all six sides. These crates are typically the best crates for large dogs, as they are strong, secure and safe, and they also provide your dog with the best view and ventilation. Additionally, most metal crates collapse for easy storage or transport. Well-built hard-sided crates can often be used with large breeds, and they are a perfectly acceptable alternative to wire models, if they suit you and your pup better. Most hard-sided crates are made of rigid plastic, and have a metal wire door and (usually) a metal wire window or two; however, some are made from plastic-coated wood or metal instead. Soft-sided crates usually consist of a semi-rigid wire frame, over which a flexible nylon shell is attached. These are often very lightweight, portable and easy to store, but few are strong enough to contain a large dog. 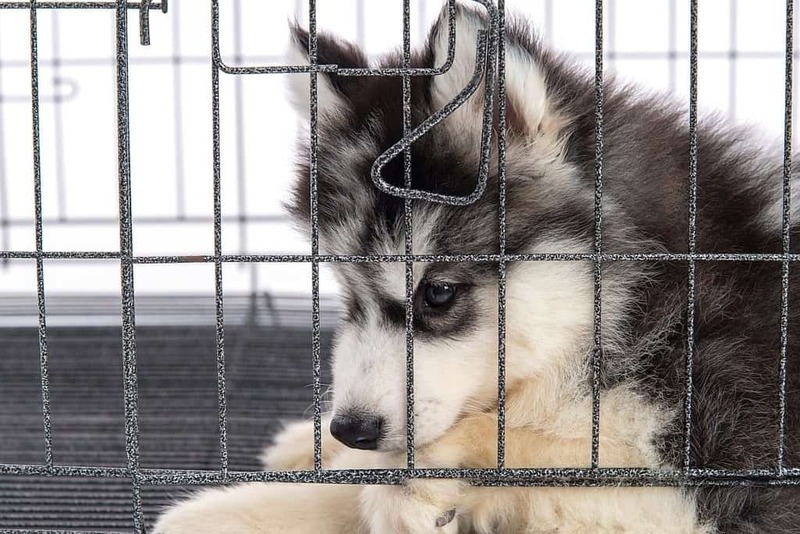 This isn’t a fundamental problem of the design, and theoretically, manufacturers may one day produce soft-sided crates that are strong enough for big breeds, but such crates would probably cost more than wire or hard-sided alternatives. As stated earlier, obtaining a crate of the proper size is crucial for your dog’s happiness and well-being. While you should consider the manufacturer’s sizing recommendations, be aware that different companies use different definitions for cage sizes. 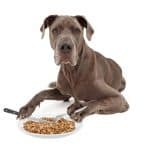 One manufacturer’s “large” may be another manufacturer’s “extra-large.” Nevertheless, owners of large dogs (those weighing more than about 70 or 75 pounds), will be looking for cages labelled large, extra-large or extra-extra-large. However, the wisest course of action is to measure your dog and select a crate accordingly. Fortunately, measuring your dog and determining the best size crate for him is super easy. You’ll need a pencil and paper (or a good memory), a tape measure and your furry friend. 1. Measure the distance between the tip of your dog’s nose and the base of his tail (do not include the length of your dog’s tail in the measurement). This is your dog’s length; write the number down. 2. While your dog is standing, measure the distance between the top of his head (or the tips of his ears, if he is an erect-eared breed) and the floor.This is your dog’s total height; write this number down too. 3. Add 2 to 4 inches to each of these measurements to provide you with the proper length and height of your dog’s crate. Most cages of a given length will feature relatively similar widths; if there is a difference, it is usually wise to opt for the wider option. For example, if you measure your dog and find that he is 36 inches long and 26 inches tall, he’d need a crate that is between 38 and 40 inches long and 28 to 30 inches tall. The best crates for large dogs typically have more than one entrance. This is especially helpful for homes that are tight on space – you can place the crate against a wall, while still allowing your pup to access the crate via the other door. While your dog will eventually need a large crate, it is best to keep young puppies in relatively small spaces (they may go to the bathroom in their crate if it is too large). By opting for a crate with dividers, you can avoid having to purchase multiple crates as your puppy grows – simply purchase the size they’ll ultimately need and use the dividers while he grows. Many metal crates have a removable litter pan that makes it easier to clean up spills or accidents. Note that large crates have very large litter pans, which can be a bit unwieldy, so you’ll want to place the crate in an area with plenty of room to maneuver it in and out of the crate. Several crates feature water and food dishes that attach to the sides or door of the crate. 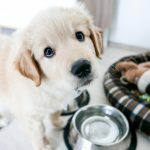 While some authorities find it risky to provide your dog with food while he’s unsupervised, most agree that it is wise to leave your pup with a bowl of water if you are going to be away for more than a few hours. Additionally, these types of mounted water dishes will reduce the likelihood of spills. Covers are very helpful for providing a den-like atmosphere for nervous pups. They can also help block drafts caused by fans or leaky windows and doors. Most covers can be used to darken varying amounts of the crate, so be sure to experiment to find the perfect amount of seclusion for your dog. Again, you needn’t consider any of these features mandatory. Always consider your specific circumstances and needs, and tailor your search accordingly. Some may not see the value in a litter pan, while others find removable dividers absolutely crucial. Look for a crate with options that are important to you (and your furry friend). The following five crates are some of the best choices for large-dog owners. Just be sure to select the one that makes the most sense for your situation. 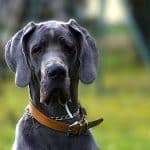 There aren’t that many gigantic crates on the market, and few provide sufficient space for a Great Dane, Mastiff or other gargantuan breed. Fortunately, MidWest Homes for Pets has you covered, with their Extra-Large model. Measuring a whopping 54” L x 37” W x 45” H, this heavy-duty crate provides plenty of space for the biggest breeds, and it is also built using materials and construction techniques appropriate for containing massive and muscular dogs. The crate is pretty heavy, weighing about 80 pounds, and it requires two people to assemble it, but that’s to be expected from a crate build to contain the Kraken. Most owners were quite pleased with the MidWest Extra-Large Dog Crate, noting that it was well-built, durable and even larger than they’d expected. More than one reviewer included photos of their dogs and family members all hanging out inside the crate together. This is a truly huge crate; in fact, several users found the crate excessively large. Most owners were satisfied that the crate was secure enough for their pet, but a few found that the cage was not secure enough for their liking. However, after adding a few zip ties to the corners, they felt the crate was rock-solid. The dual-door design is always a convenient feature, but it is especially helpful when dealing with such a large crate. The bottom pan is extremely durable, and washes off in just a few seconds with a hose. All in all, the MidWest Extra Large Dog Crate is a great value and represents one of the best large dog crates for those seeking accommodations for their extra-large dog. If your family loves to travel, you’ll want to be sure to select a dog crate that is easy to transport – like the Midwest Homes for Pets’ iCrate. Designed to be both portable and secure, the Midwest iCrate is one of the best large crates for owners on the go. This crate features a somewhat lighter build from other large dog crates, and places an emphasis on portability above all else. The iCrate is available in numerous sizes, but this particular model is built for large dogs, as it measures 48”L x 30”W x 33”H, and weighs 43 lbs. The iCrate is not only designed for mobility, it is also designed with flexibility in mind, as it comes with a divider panel. This allows you to avoid having to purchase multiple crates as your pooch grows – simply purchase the crate that will suit his adult size, and use the divider to reduce the available space as necessary. Given its very competitive price point, this crate is a great value, and easily one of the most popular models currently available. The vast majority of buyers were very impressed with how easy the crate is to set up. No tools are required for assembly, you’ll simply need to clip the side walls to the crate top. The divider is easy to setup as well, and uses the same type of latching mechanism as the wall panels do. The bottom pan is also secured by clips, which helps to keep it from sliding out of place. The primary complaints most owners expressed related to the crate’s durability. More than one owner noted that their dog was able to bend the metal panels during escape attempts. Accordingly, this is not a great cage for Houdini-like dogs who are committed to busting free (check out our guide to the best escape proof dog crates here). However, owners of calmer dogs will find that the MidWest iCrate is a great option. However, on balance, most buyers were very happy with the crate’s portability and were pleased with their purchase. The AmazonBasics Folding Metal Dog Crate is a no-frills, super basic crate designed to keep your pet safely contained and nothing more. However, while the AmazonBasics Folding Metal Dog Crate isn’t s flashy as some other crates, it still provides a great value. This product line comes in several different sizes, but this particular model for large dogs is 48” L x 30” W x 32.5” H. The AmazonBasics Crate collapses easily and weighs just under 47 pounds, making it a great option for families who travel a lot. The AmazonBasics Folding Metal Dog Crate features the same type of slide latches that appear on most other metal crates. It has a hard-plastic pan, and includes a divider so that you can use the crate for smaller dogs or growing puppies. By and large, owners loved the AmazonBasics Folding Metal Crate and expressed their satisfaction with the purchase. Most buyers loved the large dog crate’s low price point, while noting that it performed as well as many pricier options. Most reviewers found it easy to set up and collapse the crate as necessary, and the detachable carrying handle was seen as a nice bonus. The primary concern or complaint about the crate related to the strength of the metal bars. However, this is a common complaint among many crates, including those that are twice as expensive as the AmazonBasics model. This is only likely to be a problem for owners of dogs who are inclined to escape at all costs; if your dog is on the calmer side, this shouldn’t be a problem. Additionally, the pan is not secured in place, but you can easily engineer a solution to this using zip ties. Overall, the AmazonBasics Folding Metal Dog Crate is one of the best values on the large dog crate market. Although it is not the most feature-packed model available, it is the perfect choice for cost-conscious customers. Just be sure to use caution when using it for escape-artist pooches. The OxGord XXXL Dog Crate is a spacious dog crate that is large enough for dogs up about 30 inches in height. It comes with most of the same options as similar crates, and it also collapses easily when you need to travel with your pooch. OxGord has redesigned this crate from older models, by giving it smaller openings between the bars, and making it easier to fold down and store away. It measures 48” L x 29” W x 32” H, and weighs 34.2 pounds, making it one of the lightest large-dog crates available. Most customers who purchased the OxGord XXXL Crate were pleased with the crate and rated it highly. Many loved how light it is, and frequently mentioned how easy it is to break down and store away – the crate is only 4 inches thick when completely folded, thereby making it easy to store under a bed or in a closet. A few owners found that the divider wasn’t as sturdy as those of some other crates, but you are going to have to make a few tradeoffs when selecting such a budget-friendly crate. However, like many other crates at this price point, the OxGord XXXL didn’t impress many owners with its rigidity. Accordingly, it is probably best suited for calm dogs, who are disinclined to escape. The Carlson Secure and Compact Single Door Metal Dog Crate is a straight-forward crate, that features relatively few of the bells and whistles that accompany some other models. It only features a single door, and comes without any dividers. The crate measures 48” L x 30” W x 33” H and weighs about 37 lbs. Because it lacks many of the additional features and is thinner than many other products in the category, the Carlson Crate is very light when compared to others. Most owners found the Carlson Secure and Compact Crate to be extremely effective, although a few lamented the absence of a divider or second door. Although there were a few owners who criticized the durability and strength of the metal bars, such complaints were quite rare. While this large dog crate is not a great option for strong or large dogs who are intent on escaping, it will work very well for calmer canines. However, this is a common complaint across the entire product category, and such problems were only rarely reported by those who had purchased the Carlson Secure and Compact Crate. While you’ll likely be happy purchasing any of the crates detailed above, the versatility and extra features provided by the Midwest iCrate allow it to rise above the competition. This is the only large dog crate that has rounded corners on the list, and it is also the only one that has a way to secure the pan from moving around – a common problem among most other metal crates. Most owners also found that the latches were more secure than those of other cages, and that the divider fits perfectly within the crate. This iCrate has solid construction, and manages to avoid the flimsy feel that plagues other large dog crates. While not specifically marketed as a heavy-duty crate, it is stronger than most of the crates on our list. Again, as long as your dog doesn’t try to break out the moment you leave the house, it should provide ample security. Additionally, the iCrate offers incredible value in terms of both quality and features. If you’re looking for the most portable and feature-rich crate without spending a fortune, the iCrate is going to be one of the best large dog crates available. Have you stumbled across a large dog crate that has worked well for you canine? We’d love to hear all about it. Tell us what model has worked for your pet, and let us know what you like most about it.